Project Location: Sonoma Overlook Trail located on the upper Mountain Cemetery property in the City of Sonoma. Project Objectives: The Sonoma Overlook Trail was constructed in 1999 and provides a wonderful resource for hikers and nature enthusiasts. High usage has contributed to soil erosion and exposure of bedrock, creating unsure footing. This project would preserve and restore the hiking trail for hikers to enjoy. Project Description: This project has been led by a local volunteer group, the Sonoma Overlook Trail Stewards (website can be accessed here: https://overlookmontini.org/). In recent years, the Sonoma Overlook Trail Stewards have become increasingly concerned that segments of the Sonoma Overlook Trail are eroding, which lead to a number of problems, including increased maintenance, safety concerns, and the creation of rogue trails as hikers attempt to avoid the eroded segments. This project is expected to address these issues. The City, in close partnership with the Sonoma Overlook Trail Stewards and the Sonoma Ecology Center, started this trail maintenance and rehabilitation project on the Lower and Upper Sonoma Overlook Trail on June 20, 2018. The Trail is expected to be closed to the public during construction. This project consists of corrective maintenance, and in some areas, rerouted trail segments and the closure and rehabilitation of the eroded areas. Examples of the improvements, which will be undertaken by a crew of 12 young adults and two experienced trail-building supervisors with the American Conservation Experience, include: stone steps at the badly eroded main trailhead; a 795-foot reroute to avoid a severely degraded segment on the Lower Trail; rebuilding of climbing turns and junctions; and short runs of steps at key locations to alleviate gradient and erosion issues. Project Schedule: The project construction started on June 20, 2018 and the Upper Meadow Loop trail is expected to re-open to the public on Saturday, October 20, 2018. 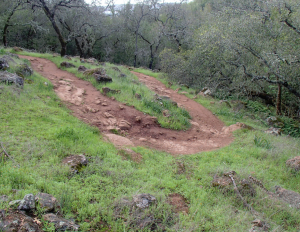 The Lower portion of the Sonoma Overlook Trail from the kiosk to the Montini trail junction, will remain closed through the winter or until soil-moisture increases and the new trail bed achieves final compaction. This "curing" period will prevent the new trail sections from premature damage. Project Budget: The project is funded by a combination of State and local funding. A large portion of the project budget comes from local fundraising in our generous community led by the Sonoma Overlook Trail Stewards. A State Parks Habitat Conservation Fund grant in the amount of $55,113 is supporting work on the Lower Trail.